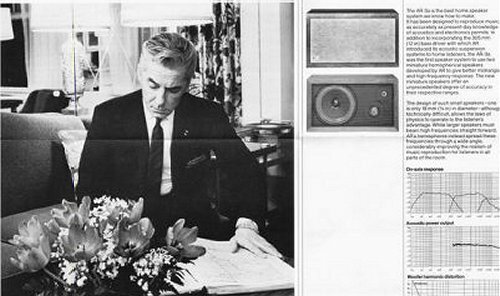 That header graphic shows Herbert von Karajan endorsing Acoustic Research AR-3A loudspeakers. Edward M. Villchur, founder of Acoustic Research, has died aged 94. Read more in When the sound really mattered. You are starting to hit home runs again and again! You have picked the perfect way to trigger a discussion of why musicians say that mediocre equipment sounds great to them. Make sure the audiophiles see this! As a student (born in the 70s) one of my prized possessions was (and still is) my AR-9 towers. Listening parties often ended up at my place (understandably). I still run into younger musicians who are fussy about how and what they listen to, but it feels a bit niche. I'm old enough that I still buy the vast majority of my music in physical formats, but young enough that I do digitize it all (albeit in lossless or uncompressed formats).